Suppose you are offered an investment that will pay you $200 in one year, $400 the next year, $600 the following year and $800 at the end of next year. You can earn 9% on such similar investments. That being said, what is the most you would be willing to pay for this investment? In other words, what is the present value of this investment? Note: To solve this problem, we must use the present value discount factor explained in the time value of money chapter. Notice from this graph that for instance if at the end of Year 1 we receive a payment of $200 as cash flows, then the present value or discounted value of that cash flow at the end of the year is $183.49. Similarly, an investment that pays $400 at the end of the 2nd year is discounted for present value at $337 now. We can perform these calculations using our financial calculator, let’s actually do it to compare our results. 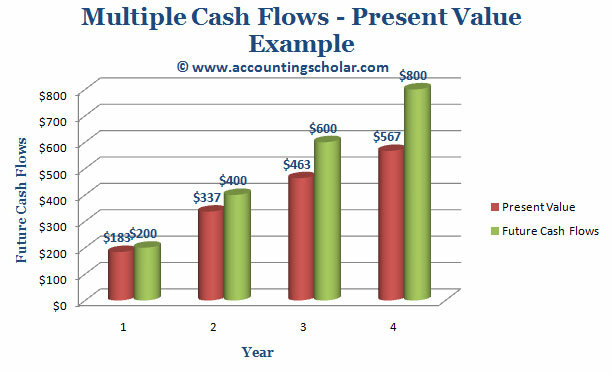 This graph shows the breakdown of the annual cash payments of $200 in the first year, $400 in the 2nd year, $600 in the third and so on and breaks down the present values of each of these cash flows in a graphical format. i) Find Present Value of $200 at Year 1, 9% rate of return. ii) Find Present Value of $400 at Year 2, 9% rate of return. iii) Find Present Value of $600 at Year 3, 9% rate of return. iv) Find Present Value of $800 at Year 4, 9% rate of return.